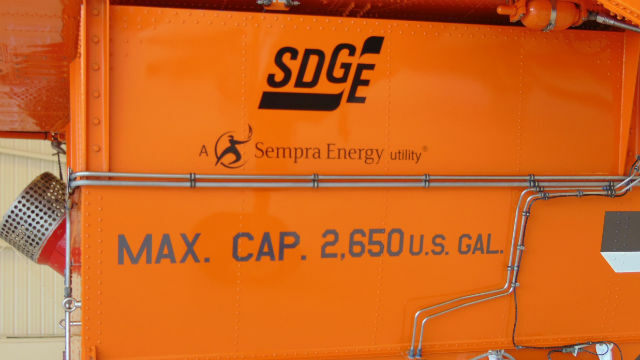 San Diego Gas & Electric showed off a giant Erickson Aircrane helitanker Tuesday as local authorities warned of a possibly dangerous wildfire season ahead. 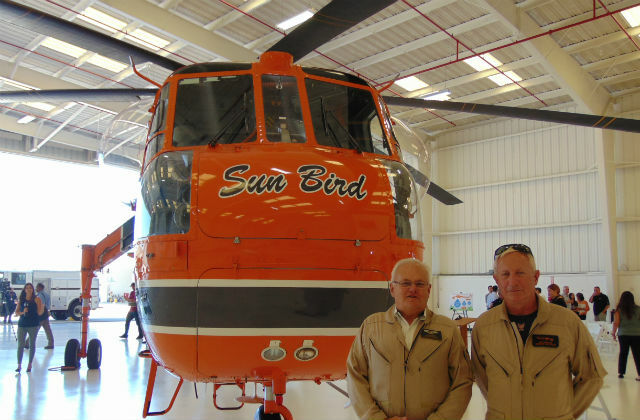 The utility is sponsoring the helicopter for the eighth year in a row to help the city and county protect life and property. It will be based at Gillespie Field in El Cajon through at least November. The extensively modified military helicopter can carry 2,650 gallons of water — the equivalent of five fire trucks. It can be airborne in 15 minutes, and after dropping its load, refill from a lake or the ocean in 45 seconds. Caroline Winn speaks in front of the helitanker. Cal Fire Chief Tony Mecham said the helicopter will be a key addition to the fleet of civilian and military helicopters available to fight wildfires in San Diego County. “The Aircrane’s quick response and decisive attack make a critical difference by stopping a wildfire before it has a chance to spread,” he said. Mecham warned that the long drought had left a massive amount of fuel in the form of dead brush and trees, making a major fire almost inevitable. “We’re going to have fires. It’s not a question of ‘if,'” Mecham said. His counterpart at San Diego Fire-Rescue, Chief Brian Fennessy, said cooperation among agencies developed during previous fires has helped keep San Diego safe. He also praised SDG&E’s support, which includes a special weather forecasting department. “With the vital weather information and tools that SDG&E provides, our fire crews are able to plan and develop response strategies giving our firefighters better situational awareness,” Fennessy said. Winn said the utility has 173 weather stations throughout the county that provide readings every 10 minutes to help firefighters. Supervisor Ron Roberts noted that the county has invested $400 million since the 2003 fires in wildfire fighting capability. “Our regional capacity today is unrivaled anywhere,” he said. The capacity of the Aircrane’s water tank.